When the holidays roll around, you’re likely especially aware of how well your dining room works — or doesn’t. As the hub of social activity and shared meals, having the right dining room features can make a huge difference in your ability to host, both during the holidays and year-round. If you’re planning to build a new home for your family or if you’re feeling ready to upgrade your current space, here are a few features to consider when planning your dining room. First things first: understand your floor plan options. This is especially important if you’re building a new home from the ground up, but if your existing home structure allows for knocking out walls, then there’s room for transforming the layout. Floor plans should be heavily influenced by your needs and the planned function of your room. A formal dining room is for those who are serious about their hosting, a space that is a fully separate room rather than multi-purpose. 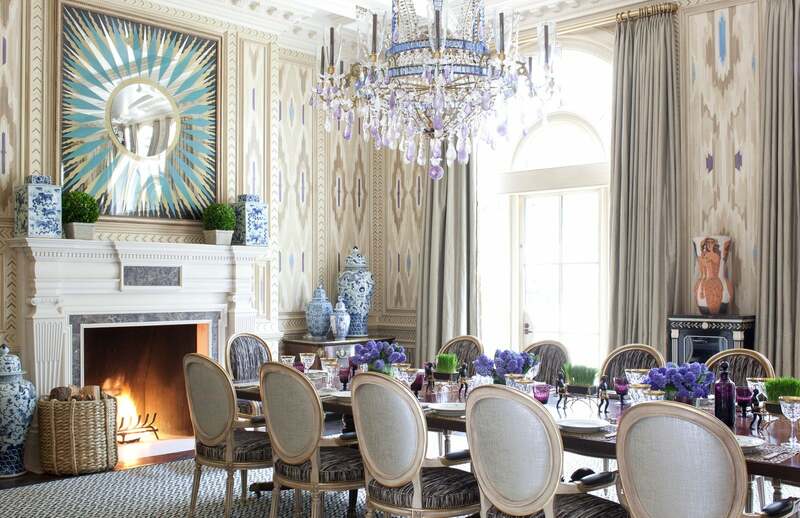 Formal dining rooms are often designed to seat 12, and while you certainly can use them on a daily basis, they’re more often reserved for special occasions, with a breakfast nook or other eating space in the kitchen for less-formal occasions. If your home doesn’t need to be quite at the level of a formal dining room, you might opt for a passthrough-style dining room. This is popular for those who prefer much more open floor plans, usually removing some or all of the walls delineating the dining space from the kitchen or living room. This is a particularly good option if you’re on a budget, or if you want to make a small space seem bigger. Whichever dining room layout you choose, you’ll want to make sure that the space has an unobstructed path to the kitchen and lots of light. Once you’ve got the floor plan determined, you’ll want to decide what will actually cover that floor. Major dining room flooring types tend to fall under the headings of hardwood, laminate, carpet or stone tile. Hardwood, laminate and stone all come with the clear advantage of being much easier to clean. Carpet can be a good option for absorbing sound and feeling warmer in the winter, but you might want to steer clear if you have children or anticipate messes. If you want some of the benefits of both, an accent area rug could be the best of both worlds. Flooring type isn’t the only way to flesh out a dining room. You’ll want to think about choosing the perfect dining room table, a piece that is likely to serve as one of the primary focal points of the room. The other major focal point is likely to be the lighting you choose. Bear in mind that you’re not limited to choosing variations on classic chandeliers. 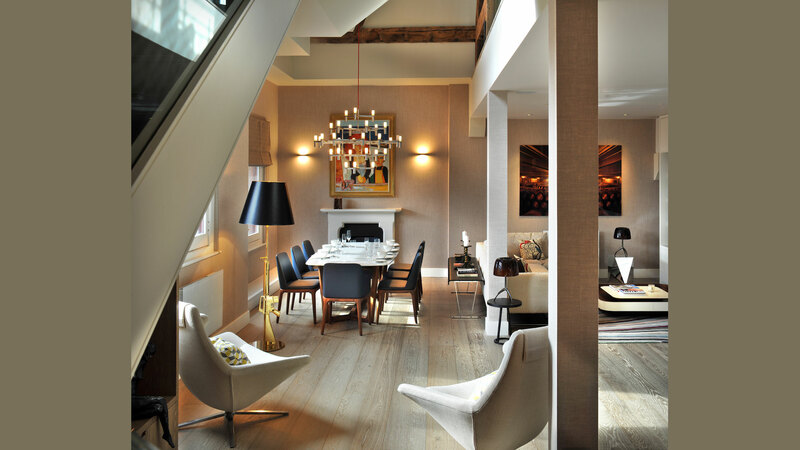 Statement lighting can go a long way to setting the mood of your dining room. The finishing touch of paint or wallpaper (or both!) will finish off your dining room. A bright, patterned wallpaper for either the full room or just an accent wall can make the space lively and playful. If your space is small and limited on light, consider pale neutrals to open the room up. Remember to bear in mind how the color scheme of your walls will interact with your chosen dining room furniture. Although it certainly doesn’t have to match, you’ll want to make everything works together to build the hosting and dining area that is a good fit for you. If you’re feeling inspired to make the most of your dining room, we’re ready when you are! Find out what remodeling services we offer.